Elisabete Jacinto completed Sunday´s prologue of the 10th edition of the Morocco Desert Challenge, which was composed of a selective sector of 77 kilometers completed along the Plage Blanche in Morocco. 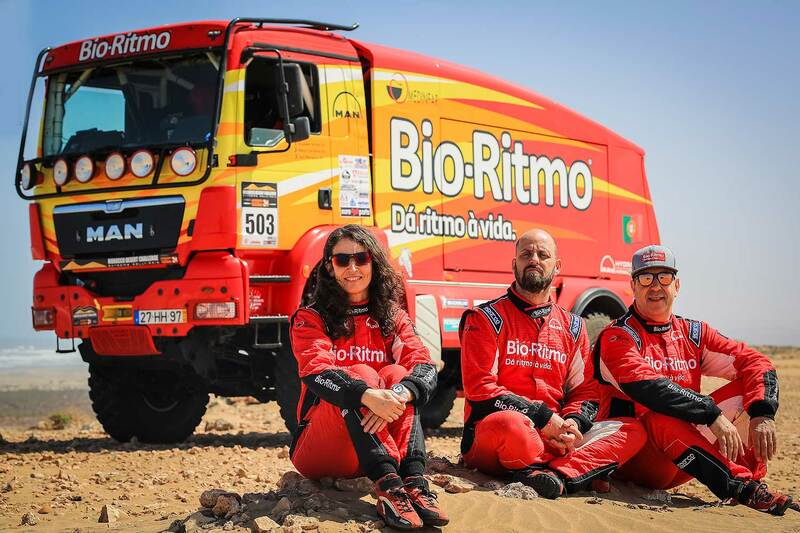 Her Bio-Ritmo Team from Portugal, despite having started in a positive way this great African competition, suffered a setback when crossing a muddy oued that ended up tossing the Portuguese to the 25th position among the trucks. Elisabete Jacinto, José Marques and Marco Cochinho saw their MAN TGS get stuck in the mud and had to wait a long time for help, which delayed them a lot. Despite the setback Elisabete Jacinto is not discouraged: "I was doing an excellent stage. We were the third truck to leave to the prologue and we were able to maintain a good rhythm and always on the right track." "At a certain point, when we were crossing a muddy oued, the truck jumped up, and as the wheels settled on the ground, they got completely buried on the mud. We tried to get out of there, but the mud was so dense that it wasn’t possible to leave without help. So we decided to call the balai truck. However, a competitor with a MAN KAT 6x6 similar to ours pulled us and managed to get us out. After that we ran in a good pace. Despite the setback we don’t fade. Tomorrow we have to do a careful progression, because we are going to leave after many slower competitors, but we believe we will be able to achieve good results", said Elisabete Jacinto. The second stage of the Morocco Desert Challenge on Monday will lead competitors to Touzounine. This special, composed by 470 timed kilometers, will pass in the bed of the river Draa and will be very varied in terms of routes. On this second day the pilots will have to face sandy oueds, mountains, with many stone rails, and dry lakes.